would like to Welcome You to our Website. Specializing in Parking Lot Sweeping, Parking Lot Striping & Pressure Washing since 1975. Our goal is to make life easier for Property Owners & Managers by offering professional Parking Area Maintanence Services such as Sweeping, Striping & Pressure Washing. Our 'One Call Does It All' approach has worked well for us and you will appreciate the difference when our service philosophy is put to work for you. You'll find that the friendly, courteous and professional staff at Southern Sweeping Services can assist you with what ever your need may be. If you are unhappy with your current service provider or if you would just like a competative bid give us a call. Bids are free and prompt. We use state-of-the art air sweepers from ﻿Schwarzes Industries﻿ & Nitehawk Sweepers, our powerful vacuum sweepers are capable of sweeping up trash, broken glass, small rock, sand, cans & bottles. Our sweepers feature rotating gutter brooms that will clean your curb lines for greater curb appeal. If your curbs & corners are not clean your parking lot is not clean! Backpack blowers are used prior to sweeping to blow walkways, corners and inaccessible area's free of all trash & debris. 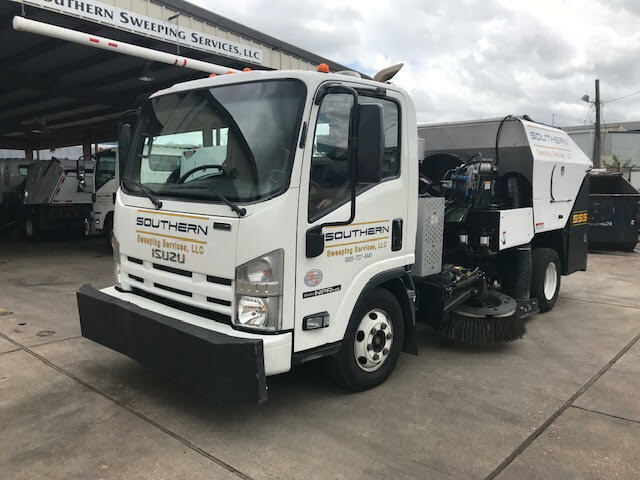 Southern Sweeping Services, LLC is a full service Parking Area Maintenance Company, keeping your Parking Area free of all trash & debris is our number one objective. Keeping your property clean and enhancing your image is our priority.